On October 22, 2012, President Mahmoud Ahmadinejad wrote an unprecedented open letter to Iran’s judiciary accusing them of unconstitutional conduct. The letter was written in response to judiciary’s decision to bar the Iranian President from visiting the infamous Evin Prison in Tehran where his media adviser Ali Akbar Javanfekr is currently jailed. In the letter, Ahamdinejad suggests that there was a “top secret” communique dispatched by the head of the judiciary, Sadegh Larijani that said the president’s request to visit Evin was not in the best interests of the country. 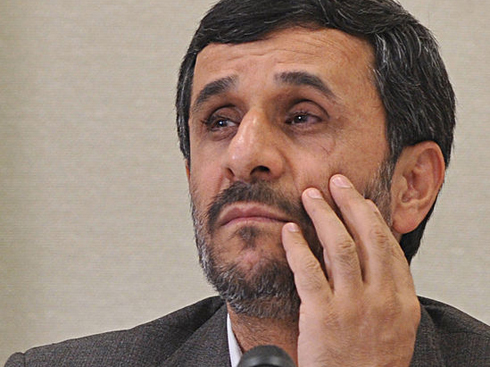 Ahmadinejad claims he wishes to investigate the conditions of prisoners. This climate of intense factional conflict has sparked a number of debates among Iran’s Netizens and civil society.Several opposition sites and journalists, for example, consider that Ahmadienjad’s letter has nothing to do with justice or human rights, but is a sign of his weakened position ahead of the next presidential elections in 2013. Iran Green Voice argues [Fa] that it is merely a conflict between different factions of the regime before the election. Ahmadinejad’s former allies have now become his enemies, and are increasing the pressure on him. Nooshabe Amiri, a Europe-based journalist, says on Roozonline [Fa] that it is “a war between wolves” and that Ahmadinejad himself is a symbol of the violated rights of Iranians. 1- The authorities do not want to give him any opportunity in the final months of his presidency to address sensitive issues, such as the treatment of political prisoners, in order to ingratiate himself with the people. 2- Conditions in Iran’s prisons are so bad that even the regime’s President should not know about them and use them as a winning card against his opponents. 3- Ahmadinejad wants to show his supporters that their fate is important to him, but the judiciary does not want to give him this opportunity. 4- The current political unease is merely a game where the regime tries to create a sense of internal opposition, in order to give ordinary Iranians the choice between ‘bad’ and ‘worse’ in the future. 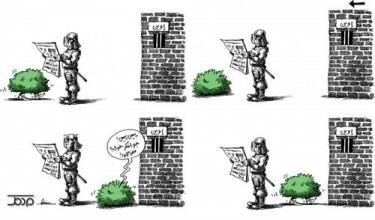 The regime’s intelligence services and think tanks are working on such a scenario. Ahmadinejad’s letter to Larijani…is a declaration of war against the Supreme Leader, Ayatollah Khamenei. The head of the judiciary does not drink a glass of water without first seeking the permission of Ayatollah Khamenei, he is really submissive to Khamenei’s will. Without a doubt, the reason Larijani’s letter to Ahamdinjead was dispatched as “a top secret communiqué” was to let Ahmadinejad know Khamenei’s opinion. But Ahmadinejad did not take this into consideration and criticized the letter with harsh words. Moeni, a blogger based in Iran who makes frequent use of metaphors when discussing politics, says [Fa] Ahmadnejad’s letter is strange and bad… “even if we do not question Ahmadinejad’s honesty, who only now thought about visiting the prison a few months before the end of his term, such a letter is only for “excitement” and overshadows the “horizon” [the overall political situation].